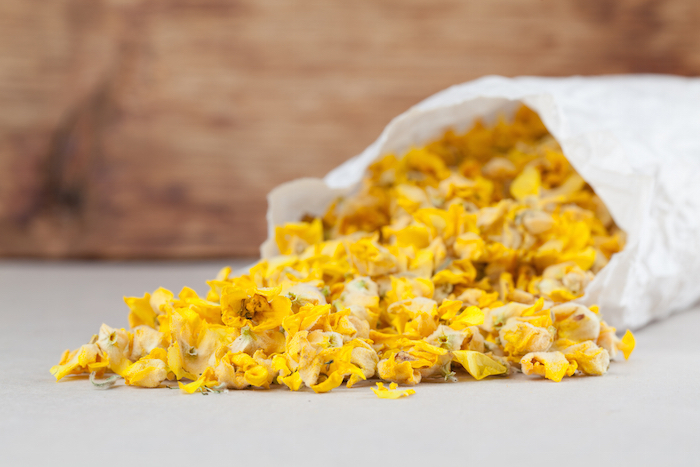 Mullein tea may not be as well known as other common herbals, such as chamomile or peppermint, but it is a true multipurpose herb and can be helpful for a variety of illnesses and conditions. Mullein is best known for helping relieve respiratory symptoms and fighting the common cold, but there is much more to this common weed. Mullein, or Verbascum thapsus, is a very common plant that grows throughout the United States. It is technically considered a weed, and the majority of people are not aware of its medicinal properties. The plant takes two years to mature and bloom. The first year, the plant grows long, fuzzy leaves that can be as long as 12 inches. The second year, a long spike — sometimes as tall as 8 feet — comes out of the leaves and will bloom in late summer. The yellow blooms have five petals and usually come out in small clusters. What Is Mullein Tea Good For? Depending on the benefits you are most interested in, it may be helpful to pair mullein with other herbs that have similar or complementary properties. However, mullein is also beneficial as part of a healthy lifestyle and is a good choice for daily consumption. What Does Mullein Tea Taste Like? Mullein tea is fairly mild compared to some other herbal teas. The roots, leaves, and flowers all have similar medicinal properties, but the taste profile is slightly different. The roots are usually used for tinctures and are the most bitter of the three. The leaves are next with an earthy, aromatic flavor with a bit of bite at the end. A tea made from the flowers is the mildest of all and is naturally sweet. It’s common for the leaves and flowers to be used together for a well-balanced flavor. Mullein is commonly paired with spicy flavors and other herbs known to improve the function of the lungs and overall respiratory health. It can also be used in combination with jiaogulan tea and gotu kola tea. Jiaogulan tea is made from a plant commonly used in Chinese medicine to boost the immune system, reduce inflammation, and improve the body’s stress response. Gotu kalo tea is also used in both Ayurvedic and Chinese medicine for its anti-inflammatory, anti-bacterial, and anti-viral properties. Combining mullein and gotu kalo tea may be especially helpful for those suffering from a cold or the flu. Anti-inflammatory. Mullein has been used in traditional medicine to help reduce inflammation and calm the symptoms associated with a variety of inflammatory conditions, such as asthma and bronchitis. Astringent. Mullein tea can be used as a compress to help speed wound healing and alleviate the pain and discomfort associated with minor cuts and abrasions as well as hemorrhoids. Expectorant. The saponins present in the mullein tea act as an expectorant, making coughs more productive, and help suppress the urge to cough. Diuretic. The tannins in the tea have a detoxification effect on the body and help flush the digestive and lymphatic systems. Sedative. The tea’s anti-inflammatory properties also help calm the nervous system and can be an effective sedative, helpful for both anxiety and insomnia. Those wanting to use mullein tea to support overall health may want to start with one to two cups a day, while those currently suffering from cold-like symptoms or respiratory issues may want to increase to three to four cups or as much as desired until the symptoms ease. Both the leaves and the flowers of the mullein plant are used in the tea, and the Mexican and Native American cultures were also known to make a tincture-like drink from the roots. Some of the compounds found in mullein include aucubin, harpagide, harpagoside, hesperidin, saponins, verbascoside, and volatile oils. Mucilage, tannins, and saponins are also present. Are There Any Side Effects from Mullein Tea? Mullein tea is generally considered to be very safe, and there are no known drug interactions or adverse effects associated with drinking mullein tea or taking mullein as a dietary supplement. Mullein tea is also likely safe in normal amounts during pregnancy and while breastfeeding, but women should be particularly careful about other herbs in blended formulas or when using loose leaf teas that are not commercially prepared. It’s always a good idea for those with pre-existing medical conditions or taking prescription medicines to get a doctor’s OK before adding any herbal remedies. There is no specific dosage needed to reap the benefits of mullein tea. 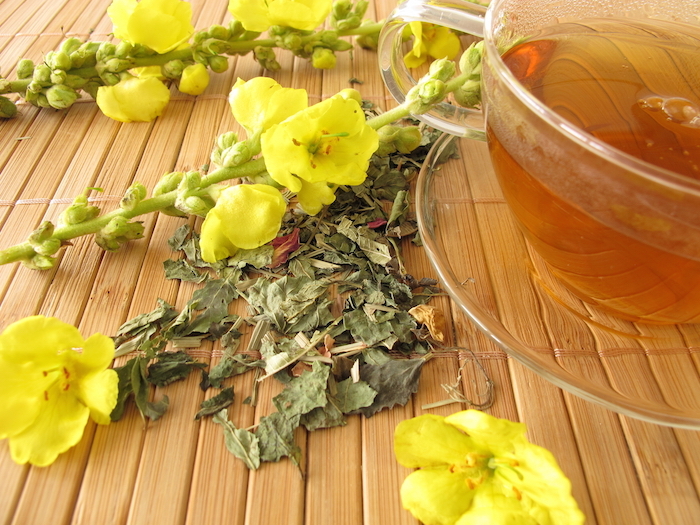 The traditional dosage for the mullein herb is three to four grams; however, the tea is fairly diluted and is considered safe in normal drinking amounts. If you’re using commercially prepared tea bags, you’ll usually get the best results by using one tea bag for every cup of boiling water and letting the tea steep for around 10 minutes, although longer is usually better when it comes to herbal teas. If you want to try to make your own, you can use the leaves, the flowers, or a mixture of both. Try six to eight leaves and/or flowers and steep for at least five minutes before straining. It’s best to strain through cheesecloth to ensure you take out all of the plant’s “hairs,” which can irritate the sensitive mucous membranes of the throat. Where to Buy Mullein Tea? While the casual tea drinker may not be immediately familiar with mullein tea, it’s relatively easy to find. Commercially prepared versions are available from brands such as Yogi, Alvita, and Celebration Herbals. The Yogi version is sold under the Breathe Deep formula and combines mullein with thyme, eucalyptus, cinnamon, cardamom, ginger, and licorice for a light, pleasantly sweet, and slightly warm flavored tea that supports overall respiratory health. Alvita offers a pure mullein tea that is best when prepared using an infusion method and served with honey. Celestial Herbals’ mullein tea is made from USDA-certified organic mullein and is free of any additives, such as sweeteners or preservatives. Who Can Benefit From This Herbal Tea? If you’re looking to add a workhorse herbal tea to your collection, mullein is a good choice. It offers the most benefits to those who may be prone to respiratory issues, general aches and pains, or anxiety. Mullein tea is a great multipurpose option for those who want to stock one tea to help with a variety of symptoms. It’s easy to find online, in most big-box stores, and in most major grocery chains. It’s also quite easy to grow for the purpose of making your own. The tea has a mild, sweet flavor that blends well with other flowery and sweet herbs and flavors. Tradition says that the British colonists introduced the Native American to using mullein for its healing benefits. The mullein plant is native to Asia and Europe but can be found growing wild all across the United States today. Mullein is known by nearly 30 different names, including Jacob’s staff, feltwort, and candlewick — the last of which comes from when the Greeks used the plant for lamp wicks.